These sweet, adorable lop babies were recently rescued from a terrible situation in Oakland where they were being raised as meat to be eaten. We estimate them to be about 8-9 weeks old. SaveABunny took them in from the Oakland shelter to help them heal and get healthier. As you can see, their feet are still filthy from living in very dirty and abusive conditions. 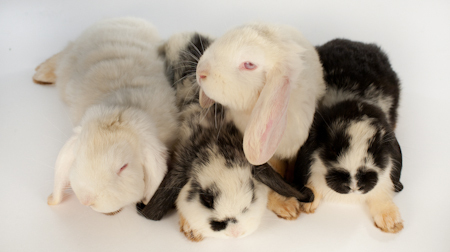 The two little white bunnies are both boys and the black and white bunnies are girls. If you are interested in fostering or adopting these bunnies special condition do apply, such as agreeing to a spay/ neuter contract. These bunnies are sweet and friendly!